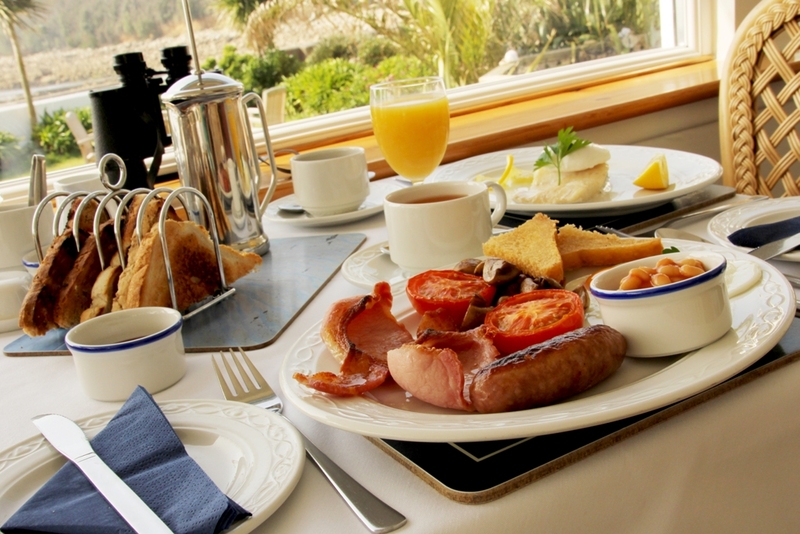 At the Wheelhouse we believe that breakfast is the most important meal of the day! Enjoy breakfast at a leisurely pace between 8.00am and 9.00am in our breakfast room which has fabulous panoramic sea views overlooking Porthcressa Bay. All of our food is cooked to order. Every morning choose from a fresh fruit platter, poached plums, prunes, grapefruit, Kellogg’s cereals, yoghurts and fruit juices followed by a traditional cooked breakfast. We serve porridge throughout the season and our house specialities include smoked haddock served with poached eggs and kippers served with scrambled eggs. Our breakfast will set you up perfectly for a day’s exploring. Vegetarian options are always available, and we will endeavour to accommodate all dietary requirements. Please contact us in advance to discuss. To see our Breakfast Menu click here.